Pattaya is one of Asia’s most famous and most popular beach destinations offering golf, beaches, shopping, excursions, activities, water sports, fine dining and entertainment. Pattaya is less than 2 hours by modern expressway from Bangkok City or 1 hour from Bangkok Airport. In addition to golf, Pattaya offers a wide range of things to see and do, Pattaya has always been thought of as good value for money and there is a wide range of accommodation in Pattaya from budget hotels and accommodation to luxury hotels and luxury resorts. Pattaya hotels and resorts include luxury properties and exciting boutique style hotels. 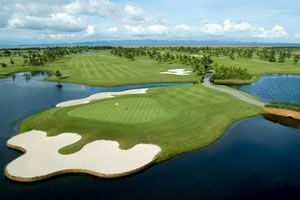 The resort for Pattaya golf is located south east of Bangkok. 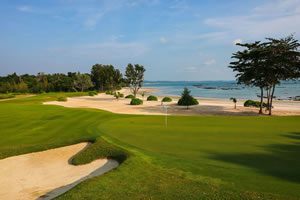 The region hosts the greatest variety of the finest championship golf courses in Thailand and is a paradise for golf vacation holidays. The combination of diving, water skiing, snorkeling, and game fishing along with the range of Pattaya golf courses makes Pattaya number one for sports activities in Thailand. Jomtien Beach is the windsurfing capital of the country with its beautiful, white sandy beaches along a palm-lined promenade. Island hopping is popular here, as an easy 30-minute boat ride will take you to isolated beaches for swimming in aqua blue waters with amazing coral reefs. Originally, Pattaya was a quiet fishing town with idyllic beaches. However, this soon became the destination for American troops on R&R during the Vietnam War, and a multitude of bars, neon lights and prostitution quickly appeared. This led to a less than complimentary image, but the city is trying to change, albeit slowly, and now on can find families, conferences, and business persons all traveling to Pattaya. Additional investments in Pattaya now make it one of the fastest growing regions in Thailand. You can find numerous five star hotels, spas, and shopping complexes in Pattaya which are sometimes compared to the best in Asia. Many of the wealthy from Bangkok reside here in their seaside second homes. Some of the fine international restaurants from Bangkok also have a sister operation here, with the choice of every cuisine. Because of its fishing village history, you will find some excellent seafood restaurants here, which provides plenty of relaxation after enjoying your golf holiday in Pattaya. There are many activities for both families and singles, from recreation, entertainment and sightseeing. On the shopping front, the night market and walking street truly has something for every taste, and offers every conceivable beer bar, pub, and discotheque. It is one of the beaches close to Bangkok and boasts many beach hotels and luxury hotels near Bangkok.